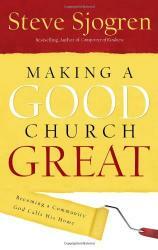 No Two Churches Are Alike--But They All Can Be Great! Instead of making your church more like someone else's, let the presence of God make your church the greatest church that only it can be! Steve Sjogren launched the servant-evangelism movement - a movement that fueled the growth of his church in Cincinnati from a handful of people to 6000 in 15 years. But along the way, Steve began to reevaluate the common assertion that a bigger church is necessarily a better church. In Making A Good Church Great, Steve shares what he has observed in more than 30 years as a church planter and coach: that a church's greatness has less to do with numbers in weekly attendance or the size of the sanctuary or staff. Instead, greatness is an ongoing process that is moved by the presence of God among His people. This book is an invitation to your community of faith to uncover its true and authentic greatness. 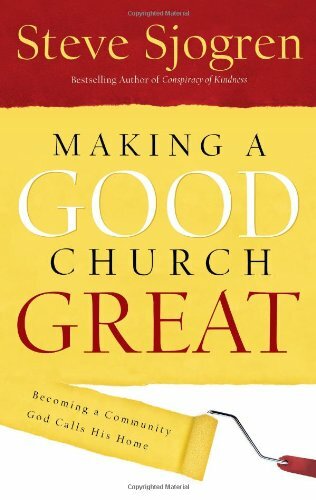 Each chapter covers a different characteristic of a great church, including simple, upward, outward, safe, fun, inclusive, generous, true, cooperative, leading out, and more. Steve offers practical steps for your church, in its one-of-a-kind way, to foster each of these qualities. Learn: How to begin now to create the atmosphere you want to see in the future, then work backwards to make it happen. Learn: How to conduct weekly staff meetings, as though you were already a great church in size and focus. Learn: How to build expectation that when you get together something great is going to happen.